Is Israel Going to War With Iran? | Have Ye Not Read? No sooner than Pentagon chief James Mattis told reporters last Friday that direct conflict between Israeli and Iranian forces is “very likely” (see my short commentary here), all hell has broken loose in the news. “At the press conference, Netanyahu exposed a secret Iranian nuclear project, codenamed “Amad,” which he said had been shelved in 2003, though he said work in the field had continued. …’We can now prove that project Amad was a comprehensive program to design, build and test nuclear weapons,’ he said. After Netanyahu’s televised address in which he painstakingly laid out his case against Iran, Iran’s “Supreme Leader” Ali Khamenei announced that Tehran “will respond to the strikes against its facilities in Syria,” which the Israeli Air Force had conducted this past Sunday evening. After the Iranian threat, Israeli defense and political sources stated that if Iran attacks Israel from Syria, either itself or through its proxy, Hezbollah, Israel will respond forcefully and target Iranian soil. Crying Wolf, Or Going to War? So is Israel simply crying wolf again, as it’s done so many times over the Iran nuclear deal? Or is there really irrefutable proof that Iran has been working toward building a nuclear arms program all of this time? So was Israeli Prime Minister Netanyahu’s speech little more than political theater designed to give President Trump the ammunition he needs in order to scrap the Iranian nuclear deal signed by former President Barack Obama? Or are Israel and Iran actually getting ready to go to war? The online pundits have been claiming all day long that Israel is going to war with Iran immediately. But as of this writing, nary a new bomb has been dropped. Thomas Friedman, political analyst for the New York Times, stated, “These are momentous days for both countries. One thing I know for sure. The status quo is not sustainable,” meaning he doesn’t believe Israel will continue to turn a blind eye toward Iran. Iran has pushed politically and militarily into Iraq, Afghanistan, Syria and Lebanon, and looks to push further into Yemen, Sudan and other strategic Middle East countries. “Touched not the ground” is an old Hebrew euphemism for approaching with great speed. But in these end days, in which military jets are a reality, it appears this “he goat” with the “notable horn between his eyes” will use an airstrike when it attacks the ram, Iran. 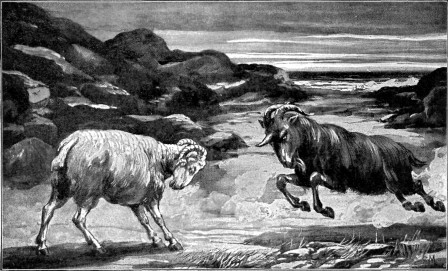 The he goat attacks the ram with exceeding ferocity. Maybe even nuclear ferocity. None of Iran’s allies will be able to deliver the nation out of the hands of the “he goat” once the attacks commence. Nevertheless, in spite of all of the war rhetoric you’re hearing, keep your powder dry, and watch, and see. Don’t let the news media get you all excited. When it finally happens – and at some point it will – you’ll know it for a fact, immediately. Our heavenly Father has told us to be watchmen (Ezekiel 33), which means we’re to learn His Word, and then watch for the end times events described therein to begin to unfold, sounding the trumpet of warning along the way. But you can’t be an effective watchman of the Lord if you don’t know what you’re supposed to be watching for. So my suggestion is read the Bible study, The 4 Winds and the Deadly Wound” for the order of events leading up to the Biblical deadly wound, including what has to happen in Iran, first, in order for that wound to ultimately come about. In that study, you’ll also learn where the deadly wound of the great book of Revelation is going to be delivered…when it’s going to be delivered…and to whom it will be delivered. And you’ll learn how it’s all tied to the “four winds” of the great book of Revelation, and why the long-prophesied defeat of Iran (Daniel chapter 8) in the final days of this flesh earth age ultimately triggers those “four wind” to blow, ushering in the final stages of one-worldism, the deadly wound, and the arrival of the antichrist onto the world stage.